Systematic Automation offers ID card printing solutions with the automatic PVC ID card printer, the CC-5000. 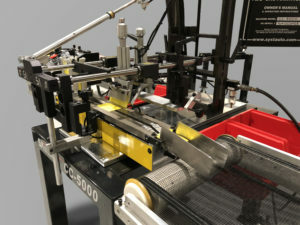 This fully automatic, inline screen printer is proven to be one of the fastest plastic card screen printing machines available with plastic card printing faster than one card per second. The CC-5000 comes with many standard engineering features providing reliable and rapid performance and many options for modular versatility. This ID card printer by Systematic Automation provides modular options to grow with your business needs such as an automatic stacker, conveyor, UV curing options and an automatic feeder system with dust removal prior to printing. Anti-static options are also available to ensure your plastic cards will not stick together, which is a common problem with generic PVC card printers and results in smudged ink and damaged product. The high tech engineering design of the CC-5000 provides a total turnkey operation and a high quality finished product. This is a PVC printer for small, flat products such as credit cards, plastic cards, luggage tags and lighters. Simple design, modular components and pneumatic operation all contribute to a highly efficient, high output ID card printer process with reliability and consistency. The CC-5000 PVC ID card printer revolutionizes the screen printing industry with high tech screen printing solutions in a simple and affordable design. Standard features include adjustable print and flood stroke speed, vacuum force with on/off vacuum pump control and accommodations for pretreatment, anti-static and clean wipe stations. Manufactured with stainless steel air cylinders and high-quality, precision machinery, this PVC card printer is built for long-lasting durability. 100% pneumatic air operation ensures the system will not overload or burn out, providing continual smooth and quiet operation. The universal screen mount and easy removal of the squeegee and flood bar assembly provide quick and efficient job changeover. Machine leveling, emergency stop and a pneumatic control panel all provide simple operation with high tech results. Systematic Automation offers a wide selection of high quality, precision screen printers in various models with dozens of engineering features to meet any screen printing needs. We are a leading global supplier of screen printing machines and vacuum table systems with pretreatment and posttreatment equipment available. Contact us to learn more about our screen printing solutions including successful plastic card printing with the PVC ID card printer.